HR team : What are your staff thinking? We recently polled our user database to gauge how likely they were to leave their existing employer. The results surprised us! Admittedly it was not a scientific poll but an indicator of how people are feeling. Staff Turnover - good or bad? Any staff turnover used to be seen negatively in the jobs for life era but now amongst many circles - it is celebrated at least when it is a "healthy" churn. New staff can bring new ideas and fresh perspectives. In that instance, we celebrate the departure of ex-staff and celebrate the new ones. However, there is a point where certain staff are critical to the business and their departure means; a big loss of knowledge and experience to the business and of course cost. 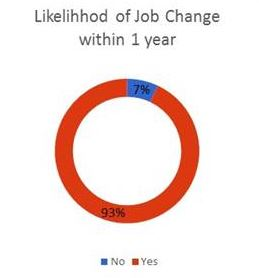 In response to the question: "How likely are you to change jobs within the next year? " There were over 60 respondents to this poll and, again we stress perhaps a small sample but 94% in any poll sample is overwhelming sample bias aside. So, If your employees are thinking about better opportunities for themselves, and if they are critical to the business, then there are dire implications for your business. Sure, it might be that the economy is buoyant and people feel the confidence to move but is it all due to that - do you know? Do you know what the baseline churn for your organisation is vs. your industry? At the risk of stating the obvious, do you need to swing into staff retention strategies....before they walk out of the door and it is too late? What is the cost of hiring vs. retention? What does it mean for morale? What can you do? We would welcome your feedback on staff retention strategies.